When one talks about Roadrunners, many of us have the image of that incredibly fast bird from Saturday morning cartoons. Around our house, Roadrunners represent the speedy daredevil that races across the road just in front of the car, or speeds along with a lizard dangling from its beak as it ducks under the fence. Occasionally, one will fly over the fence or up into the low branches of trees. One place we almost never consider looking for one is in the tree tops. We were working outside when I heard a low cooing sound. It was similar to a dove, but not quite right. After a few minutes of searching, I found the owner of the voice. 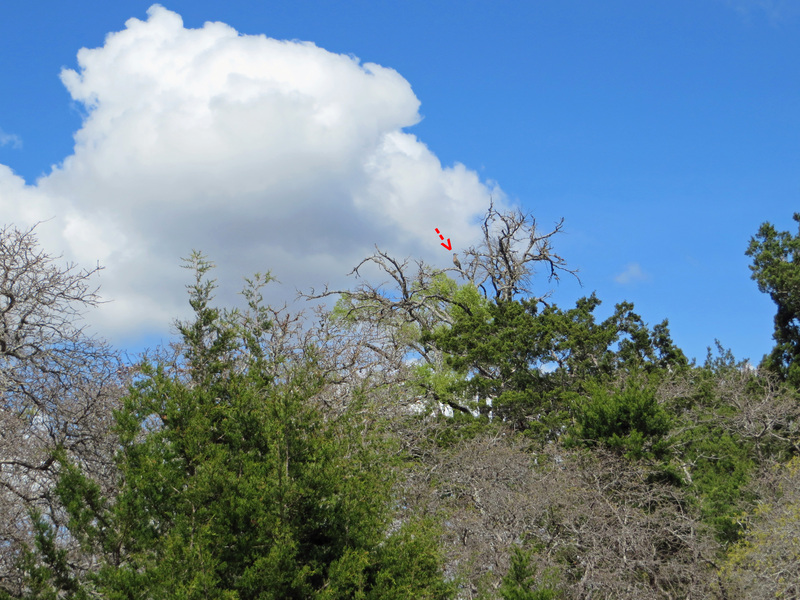 This Roadrunner was sitting in the top of an old cedar elm tree cooing to his heart’s content. I apologize for the grainy pics. This guy was very far up in the tree and I had my little Canon PowerShot SX 280HS with me. It is easy to carry and I love the zoom capabilities. Unfortunately it has never quite been the same since a trip to the coast a few years ago. Still the camera I carry in my pocket most of the time.